I was pleased to receive this CD in the mail, as it included historic cylinder recordings (not disc records, mind you; wax cylinder recordings) by three great American accordionists whose performances helped form the foundation for the "golden age of the accordion" in the first half of the 20th century: John J. Kimmel, Guido Deiro and Pietro Deiro. I was especially pleased to receive this anthology, as I will be performing two of Guido's compositions at City University of New York in March later this year (see Free-Reed Center Announces Symposium and Concert). Real Ragtime elicits the highest praise from a tired and jaded reviewer like myself. 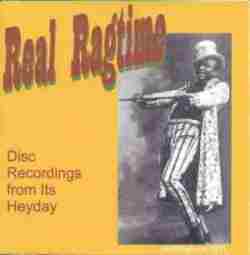 The 18-page booklet includes an essay on ragtime, biographies of the performers, descriptions of each track including title of song, composer, time, performer, date and place of recording (including which take was used, if known), cylinder label and number, and comprehensive notes about each piece. For instance, let me share with you the booklet notes about Kimmel and the piece he played. John J. Kimmel (1866-1942) was particularly skillful at rendering Irish jigs and reels, so his friends nicknamed him "The Irish Dutchman" -- despite his being a Brooklyn native of German parentage. He was the first accordionist to make commercial records in the United States, having begun his recording career with Zonophone about 1904. His regular accompanist was Joe Linder (1870-1943), a piano-player who was unable to sight-read music and played almost entirely from memory. Kimmel was known on the vaudeville stage with acts "such as coming out and playing four-part harmony on cornets, then saxophones, xylophone and, of course, during scenery shifts he'd solo on the accordion," as an acquaintance recalled in 1953. Kimmel was also a saloon-keeper, although his last establishment, "The Accordion," folded due to Prohibition. I'm not going to quote from the notes about Guido and Pietro Deiro (Deiro Rag and Hungarian Rag); you're going to have to buy the CD first. However, I will whet your appetite by revealing that the booklet includes a photo of Pietro from the November 1915 catalog of Victor Records. In my opinion, every self-proclaimed lover of the accordion should be embarrassed if this disc is not in his or her collection.